Earlier this month (May 2016), Preschem was asked to give a presentation on why timber changes colour at the Victorian Woodworkers Association. This got us thinking that this topic would make a great general knowledge post. After all, this will assist with some of those decisions on what to do when building something out of wood. Why does timber change colour? Preschem’s range of industrial power pole wood preservatives and DIY/Architectural finishes are mostly unique formulations. They are unique due to our commitment to innovation. To achieve this level of innovation and proven product reliability is not an easy undertaking. Behind the scenes, it takes a lot of hard work in terms of Research and Development. R&D can also be a lengthy process, as to prove the formulation works, it can take up to 10 years of field trials and analysis of those trials. In addition, all timber preservatives have to be registered under government legislation, so to get a new product up and over the line with a complete data pack is also very expensive. I have discussed the registration process in this previous post. All of the points above mean you will be able to apply more Aussie Clear to the timber. 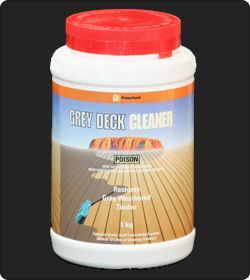 Your first application of decking oil will last much longer. All this theory is very good, but where is the proof in the pudding? The Channel Nine Today Show reported that there had been 4 balcony collapses over last weekend, one of which resulted in the death of a man. Earlier in February this year, there was another balcony collapse on the Central NSW coast which claimed the life of a baby that also put his mother into hospital with a suspected broken back. These tragedies are usually result of either poor workmanship or from timber decay. How do you prevent balcony collapse? Regularly inspect the timber structure for signs of decay. If decay is present, determine if its superficial or more substantial. If superficial, apply a presevative system to kill and prevent further rot. If you are not sure how to diagnose the extent of the problem or it is substantial, call in a registered builder to repair or replace the weakened structural timbers. Make a diary note to inspect it again in 12 months time. 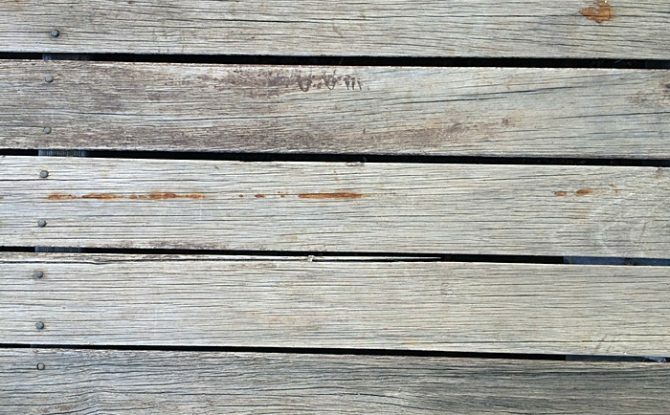 When you get around to reapplying your Aussie Clear decking oil after 9-12 months, there are a few simple things you should do before hand to ensure fantastic results. Penetrative timber finishes applied over a poorly prepared deck or any other exterior timber, will result in very poor results. Correct timber preparation prior to oiling your deck will ensure fantastic results. 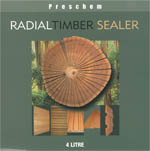 Preschem has recently re-released it’s Radial Timber Sealer product. However, it’s a new high tech formulation from the ground up! 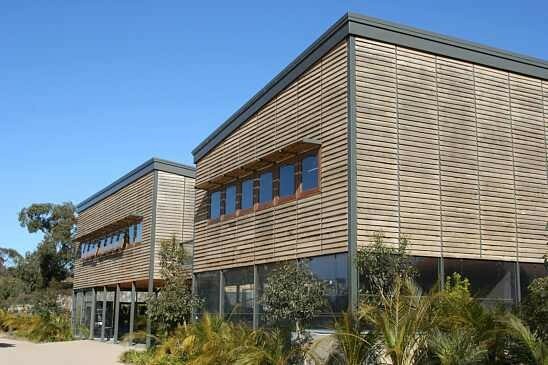 This wood finish was originally designed for Radial Timber* projects, where the architect or customer wished the timber to weather off to that silver-grey look, while protecting it from the elements. As far as timber finishes go this is a specialist product and as such, may not be very well understood. Hopefully this post will explain clearly the features of Radial Timber Sealer. We’ll start at the beginning which means a quick lesson on timber and dimensional stability. All wood has a natural moisture content. This moisture content varies significantly depending on a number of factors such as is it “green” meaning unseasoned through to being properly processed and dried such as kiln dried. Typically Australian Eucalypt timber that’s “green” has a moisture content (MC) as high as 80%. Kiln dried timber will be between 11-15%. The significance of this is when timber changes MC it shrinks if it’s drying, but expands if it takes up moisture. Rapid changes in MC can cause issues such as warping, cupping, splitting and checking. What happens is the outer surface shrinks or expands rapidly, but the timber under that surface takes longer to change MC, so internal stresses are created. This is dimensional instability and is to be avoided where possible. When timber is processed from green to kiln dried, it is done slowly and carefully to avoid this. However, even timber that has been properly kiln dried can still have splitting and checking occur when its placed in a weather exposed situation, especially without any finish applied. The wood will still adjust it’s MC to its environment and this process is called seasoning. Seasoning will also cause dimensional stability issues. If you wish to maintain the timber’s “new look” rather than allow it to go grey, then the timber finish product to use is Aussie Clear for mid to dark toned hardwoods, or Aussie Clear Light for blond and lightly coloured timber. Exterior Pine Clear is the recommended product for Treated Pine. * Radial Timber Sales is the wholesale/retail arm of Radial Timber Australia. Both companies are part of our wider business group. The Radial technology of cutting sawlogs is unique technology that allows very high yields from smaller plantation or new growth logs, while improving dimensional stability. Visit radialtimbers.com.au for more information on the technology and product profiles. Which Wood Preservative for painted Timber Windows with rot? No Rot Gel. 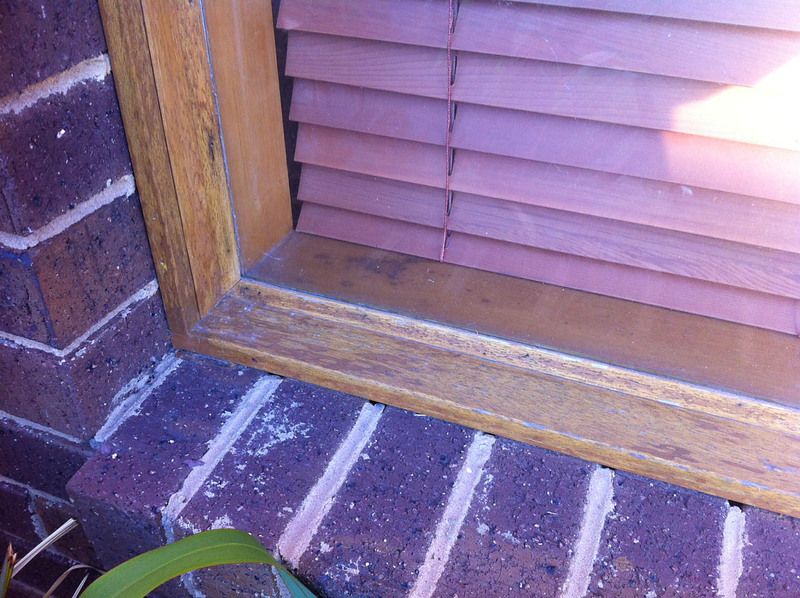 One common question asked by the public is how to conduct a window repair when its affected by wood decay. The next question always is, what’s a suitable wood preservative when the window repair is to be painted over. The answer is quite simply: No Rot Gel. Strip or sand back the painted surface to bare timber around the affected section, preferably 300mm in all directions from where there is visible decay.This is advisable even if the rot is localised in one small section, as the fungi will be spreading via tendril like fingers that will be difficult to detect under the painted surface. The fungi will do this to spread elsewhere if the conditions are right. It’s best to knock it properly on the head the first time rather than have it causing you grief several years down the track, including the potential of having to replace the window frame entirely. Dig out the dry rot carefully with a chisel or similar implement until you get to sound wood. Apply No Rot Gel timber preservative as per the directions on the pack. Ensure that 2 coats are applied within 2 hours. If you leave it longer than that between the recommended two coats, you run the risk of the solvent drying, which means the second coat will not soak in. You can apply the second coat as soon as the first one has soaked in. Use a suitable exterior timber filler to repair the cavity. Allow it to dry as per the manufacturers recommendations, then sand to a smooth uniform surface. Paint over the repair with a quality exterior paint. The advantage of No Rot Gel being used in this way is that it will kill and sanitise any dormant or active wood rot including the tendrils that are looking for another spot to grow. In addition, the timber preservative is locked in under the paint, where the boron active ingredient will remain there indefinitely, waiting for such a time where moisture starts finding its way back into the timber. Obviously if you’re properly maintaining your painting, then this could be a very long time indeed, as dry wood won’t rot. Note: If you’re wanting a timber treatment for exterior use that won’t be painted over, then Timber Preserver is product to use.